2. Aircraft in Miniature have re-issued their S-61N conversion for the Airfix Sea King with decals for KLM Helikopters PH-NZL. This set (with Bristow decals) was comprehensively reviewed in HKN #103. 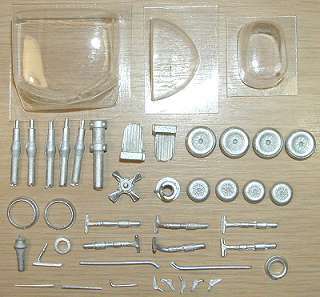 The KLM set differs in detail, for example the sponsons do not have the flotation bags moulded onto them. AIM are willing to sell the decals (and individual parts) separately, although of course they would rather sell you the whole conversion kit, and the price of the decals perhaps reflects this. 4. 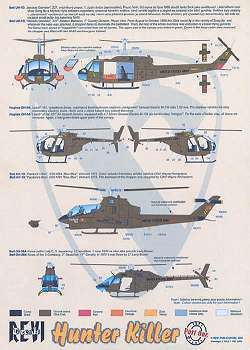 The Model Alliance RAAF / Australian Army AS-350B Squirrel decals are now numbered AA-7204 and AA-4804 (cf. HKN #156). You get Army titles, danger arrows, a pair of flying birds, and both RAAF (1984) and AAATC (1988) style serials for 17 different white & blue painted aircraft. Also new from Model Alliance is RAN-7220, the Scout AH.1 of 723 Sqn., RAN. 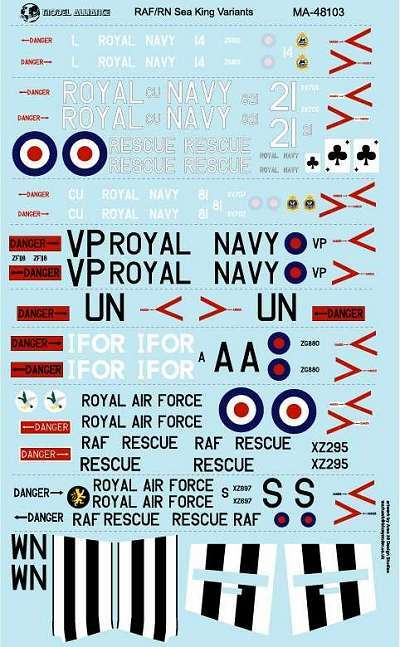 In this you get a pair of roundels, danger markings, Navy titles, and two sets of alternative markings for each of the two aircraft; the first can be WS 101/841 or N8 101/891, the second is WS 102/842 or N8 102/892. 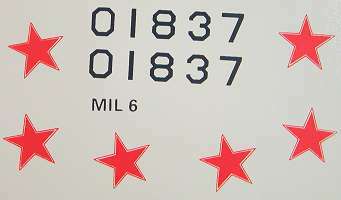 The majority of the markings (with the exception of the roundels and the 'danger' warnings) are impossible to photograph, being printed in white on white decal paper. 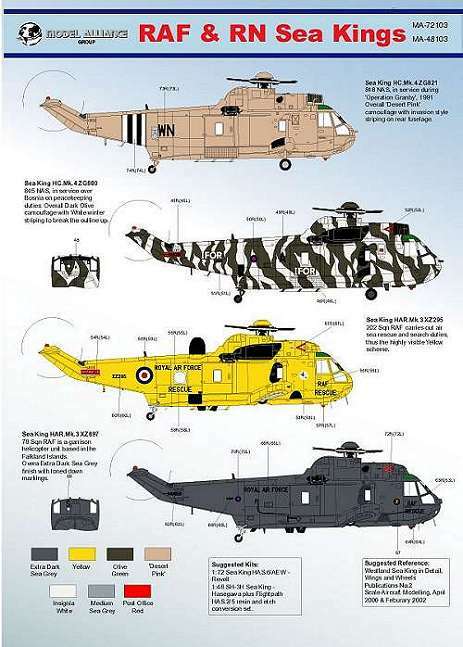 Model Alliance's new Sea King sheet will be released in both 1:72 (MA-72103)and 1:48 (MA-48103) in early February 2003. Here's a preview of the 1:48 sheet and some of the artwork. 5. Anders Nowotny is working on decals for the Swedish HKP 6 / JetRangers SE-HLY (Y44) and SE-HLZ (Y45) operated from the icebreaker 'Ymer' in the Antarctic in 1980. These were green drab with the addition of orange vertical stabilisers, prominent red and white flashes along the sides, Marinen insignia on the sides of the nose, and Isbjцrn (polar bear) markings on the rear fuselage. 6. A set of 1:72 decals for the Cierva C.8R G-EBTW are available from Mike Grant Decals. This excellent sheet includes the 'Palmer Cord Aero Tyre' markings on the tyres and stiching for the fuselage skin seams. 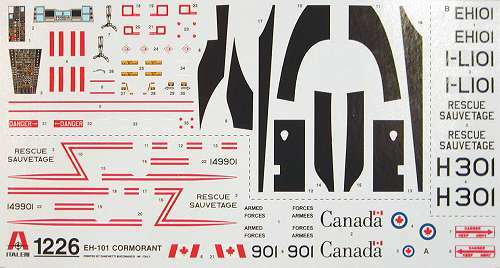 Each sheet carries sufficient markings to make two models of this aircraft. 7. The Czech aviation magazine Revi has published a set of decals in both 1:72 and 1:48, printed by Tally Ho! These are titled "Hunter-Killer", and are a selection of US Army Vietnam era helicopters. This sheet is the first of a proposed series of decals. OH-6A 16135, 101. Airborne Div. 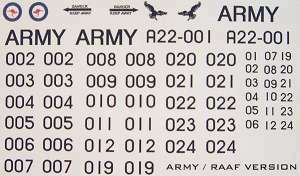 You also get a large selection of numbers that can be used to make up other serials, plus a number of Cav. shields. 8. Revell have released #4458, their new 1:48 MH-60L. 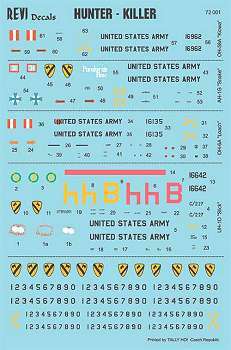 This kit includes decals for two aircraft from the US Army 160th SOAR, one of which carries "Southern Comfort" artwork. Since the box says that it is made in Italy, I assume it is based on the Italeri MH-60G moulds rather than on the Academy / Minicraft moulds. 9. Italeri's CH-149 Cormorant version of their earlier 1:72 Merlin HAS.1 kit (also available from Revell as the HM.3) is now available. Decal options are provided for both the demo machine PP9/I-LIOI (shown here with slightly differnt markings) and for the first production aircraft 149901. The parts on the sprues would build something resembling a hybrid of the two, but rather closer to PP9 than to 149901 and subsequent deliveries. 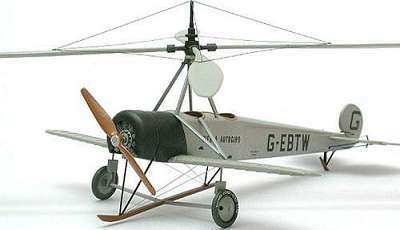 the tail RWR, one blade aerial and the tail-fold parts are not used. a (single hook) winch has been added. This means that you get the single main-wheel undercarriage from the HAS.1 rather than the double wheeled undercarriage from the HC.3 kit. Modifying the legs isn't a problem, you just need to add another stub-axle, but to build the production machine you're going to have to find another pair of wheels from somewhere. Sprue B is the one with the one with the main rotor blades on it, and is identical to that in both the HAS.1 and HC.3 kits. 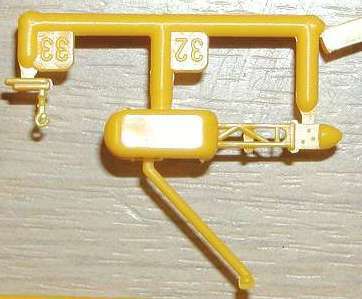 Sprue C includes the rear fuselage, ramp, seats, etc. It is identical to HC.3 kit except that the refueling probe & dorsal disc arial are deleted. The troop-seat layout in the instructions is the same as for the HC.3. This is not correct, refer to these walkaround photos. Sprue D is the clear parts. This is the same as in the HC.3 kit, with just the two round bubbles for the rear windows. The window in the port cabin door is small rectangle only, it should be large square bubble. The front starboard window is flat, this too should be a square bubble. The window in the main cabin kick-out door is incorrect (small) but easily modified since there's a cut-out on the inside. new sponson sides correct for PP9 but not for production aircraft, which are the same as the HC.3. various new pitots, aerials & underside boxes that may or may not be applicable. Some of them look right. Other obvious omissions include the Nite-Sun on the port side of production aircraft and the flat/round radome for the rear starboard fuselage (as seen also on the HC.3). 10. 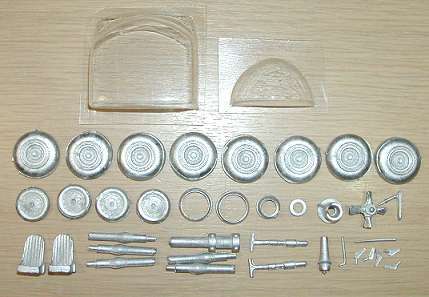 Sanger's 1:72 vacform Mi-10 and Mi-10K kits share the same vacform parts, but differ in their white metal parts and decals. 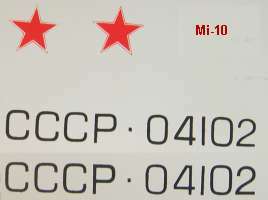 A number of the parts on the vacform sheet are applicable only to the long-legged Mi-10, including the long leg parts, so will not be used if the Mi-10K is being made. The vacform transparencies supplied with the short-legged Mi-10K also include the crane-operator's gondola which is absent from the Mi-10. Comparison with the detailed scale plans and sections published in Aviatsya i Vremya 3'2002 suggest that the profile is about right but that the cabin section of the fuselage has rather flatter sides than it should. However, these two Mi-10's are a valuable addition to the range of available kits, and no-one expects vacform models to go together without some extra work! 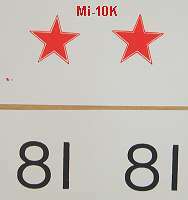 The decals supplied are restricted to serials and red stars, as are those now available for the earlier Mi-6. Thanks to Jaroslav Spacek, Tony Morgan, Gary Madgwick, and Anders Nowotny.